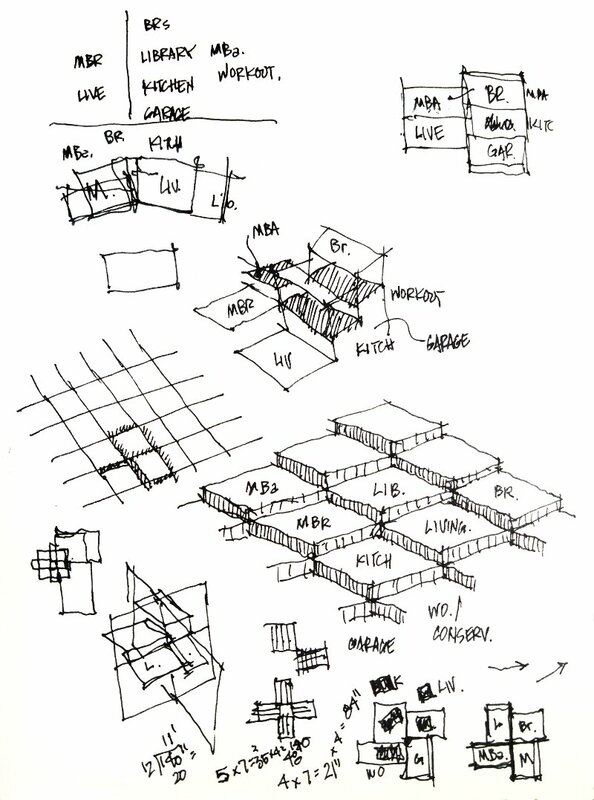 Sketching is the fastest way to analyze three-dimensional relationships. I usually rely on 3D virtual models to firm up the details, but my initial sketches form the foundation of thought that shape the rest of the process. The above sketch is a house set on the side of a mountain in Black Mountain, North Carolina. 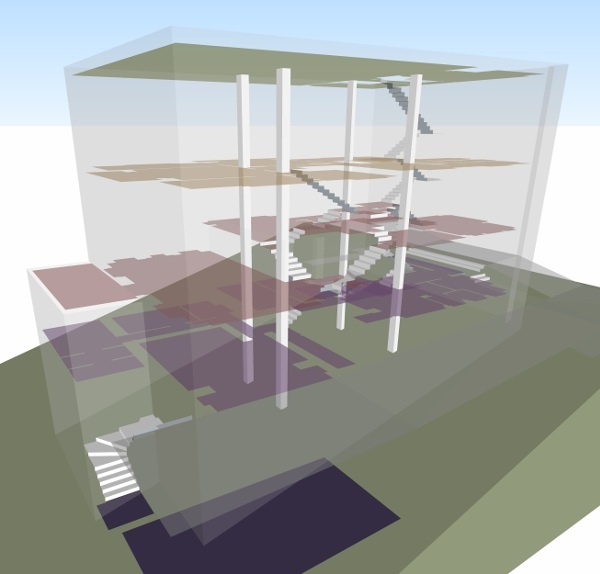 It's a given that the structure and forms need to respond to the steep slope of the site. But an additional demand is that it also be accessible... useful with an age in place strategy for the homeowners as they become elderly and potentially too feeble to negotiate full flights of stairs at a time. With these guidelines, I instinctively look for a scheme of half levels. This keeps intermediate flights between spaces at most six steps. It also balances the house across the site and minimizes the amount of deep cuts or fill areas that might be required of the topography. The above sketch are numerous quick looks at such a scheme. It is important when creating series of spaces to understand their relationships. You can see abbreviations for the living areas scattered about the drawings. Hurried and loose sketches help keep the exploration fluid and flexible. Nothing is fixated until the entire scheme begins to come together. A developed depiction of this concept can be seen in the 1934 Villa Muller by Adolf Loos, in Prague. For this early twentieth century Viennese architect, his crowning work was also his last. It is a rich example of his concept for multi-level floors within a simpler exterior, which he called Raumplan. Villa Muller's exterior is a simple, unadorned cube. It was intended as the quiet, reserved public face of the house overlooking the city. But the interior is an exuberant intertwining of spaces and materials connected by short half flights of stairs. Many, small, comfortable and intimate spaces are all tied together by paths and views into and across each other. Below is a floor level diagram. It is difficult to understand in two dimensions so I've removed all the walls from the model and colored each floor uniquely. Except for the top floor (orange) and the roof, the two lower main floors actually have sections that ascend or descend from the neighboring section. From the lowest, darkest basement level all the way up to the walkable roof, there are multiple sets of stairs connecting each quadrant of the house. Both stairs are centered under skylights on the roof so that natural light is filtered down through the entire house from above. It's a masterful scheme in just 3,400 SF. This entry was posted in 4D»2B, Site Planning, Sketch and tagged Adolf Loos, design, massing, site planning, sketch on 2017-02-14 by Steve Hall.